Let's end the year on a happy note. And happiness is this photo series by photographer Lara Jo Regan. 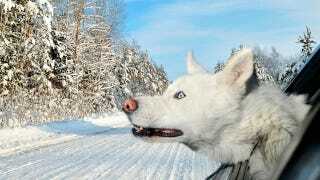 Called Dogs in Cars, it's photo after photo of well, dogs sticking their heads out of moving cars. Is there anything in the world more joyful than seeing that? I don't think so. PetaPixel says that Regan first started taking pictures of dogs sticking their heads out to capture the "amazing primal energy" that dogs have when they get to take a car ride. It's true. Get a dog in a moving car and you'll see how wonderful life can be. But all that bundled joy isn't always easy to photograph. Regan told PetaPixel that there were times she was strapped to the roof of a car in order to get the perfect shot (don't worry, she made sure the dogs were always safe). You can see more shots of Dogs in Cars and buy the calendar here. Lara Jo Regan's site is here.